But prefers "cheapest" method possible - exposes Annan "peace deal" as insidious gambit to "buy time." April 13, 2012 - As if there was any doubt, NATO's official "Alliance News Blog" has confirmed that the US is committed to the overthrow of Syria's government and is "already committed to helping [President Bashar al-Assad] fall," but is "merely looking for the least violent, lowest cost way to get there." 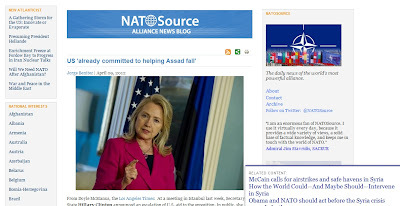 The April 9, 2012 blog entry features an op-ed titled, "US 'already committed to helping Assad fall'," and fully admits that the US is equipping the so-called "Free Syrian Army" which has received weapons, leadership, and cash from the NATO-backed Libyan Islamic Fighting Group (LIFG) terrorists led by notorious mass-murderer Abdul Hakim Belhaj. Not only has the US and NATO been lying to the world with the United Nations fully complicit, but they now are openly admitting as much - that their feigned aspirations to end the bloodshed in Syria is merely a ploy to buy time for their faltering proxy terrorist force to reorganize itself and finish dividing and destroying Syria as NATO-proxies have thoroughly done in Libya. NATO admits that military intervention is not a matter of "if" but a matter of "when" depending on a predetermined number of objectives that must be achieved first. These include the Syrian opposition getting better organized, assurances that military aid wouldn't fall into the hands of "radical Islamists," and for Turkey, just as Brookings previously stated, "to establish safe havens for the opposition along its border with Syria." Certainly, openly conspiring to wage a war of aggression, when Syria has in no way threatened any NATO member nor the national security of leading NATO-member, the United States, is a Nuremberg offense - a crime against humanity. The chaos unfolding inside Syria today is not the result of a government wantonly killing its own population, but a documented case of a government fighting an overtly foreign-funded armed group, carrying out atrocities on par with anything the Syrian government has been accused of - this according to the West's own Human Rights Watch. Compounding their criminality is the fact that instead of taking advantage of a ceasefire to broker a peace deal and begin reconciliation, they are instead using the lull in fighting to prepare the next round of bloodshed they are fully prepared to fund and arm. Far from speculation, the conclusion that NATO is guilty of crimes against humanity is based on the West's own United Nations which stands in violation of its own laws stemming from World War II, Nazi aggression, and the conclusions drawn from the Nuremberg trials (description of Nuremberg counts begins on page 23 of the .pdf). Failure in Syria by the forces of NATO and their accomplices in the UN would ultimately undermine permanently their authority, their legitimacy, and their perceived moral superiority. Expect them to stop at nothing to topple the Syrian government - regardless of how tenuous their position increasingly becomes.